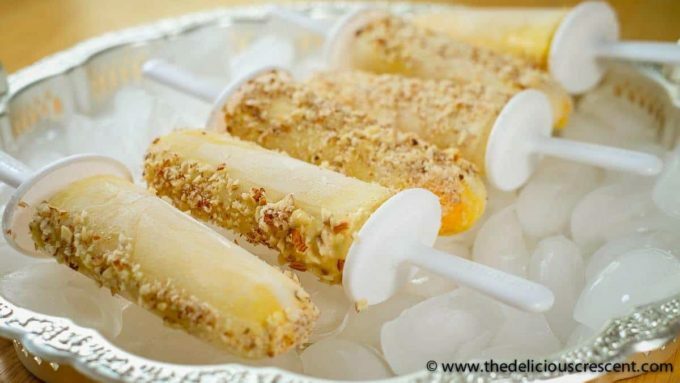 Badam malai kulfi is a traditional Indian popsicle, made amazingly easy in this recipe. But still with mouth watering creamy taste and enveloped in fragrant flavors of almond, rose and saffron. This kulfi comes with less added sugar and saturated fat but with more protein than the traditional version. 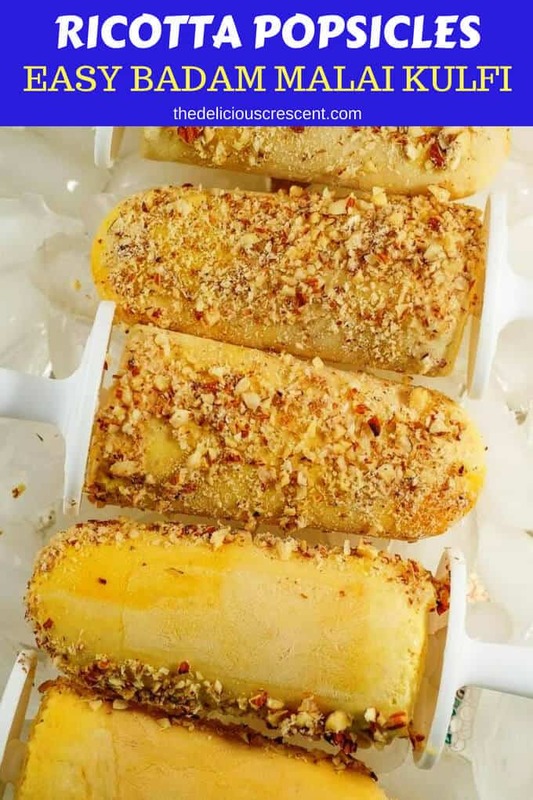 Kulfi is a popular Indian frozen dessert that is made using milk, sugar and some flavorings. It is sometimes referred to as the Indian ice cream, but it is actually denser with a higher concentration of milk solids. It is traditionally prepared by a lengthy process of cooking down the milk for several hours, during which the kulfi mixture obtains a remarkable flavor due to the caramelization of milk and added sugars. This concentrated thick mixture is then poured into molds and frozen. Nice creams made with bananas is quiet a well known concept. So I have tried to apply that to this Indian popsicle. And with the use of readily available ingredients such as ricotta cheese and evaporated milk, this recipe offers a quick and easy way to make your own homemade kulfi. Plus with improved nutrition facts. And the variety of kulfi here is made with some badam (almonds) and malai (cream). Talking of exotic cool treats, you may also like Healthy Rose Milk, Chia Mahalabia and Rose Rice Custard. A really refreshing popsicle recipe also on the blog is my Melon Popsicles. So this recipe for an easy badam malai kulfi comes with some improvements in nutrition facts. Mainly it cuts down heavily on the added sugars, since we are using bananas to sweeten the dessert for the most part. Remember it still has the natural sugars that come from the fruit, but those sugars come along with a lot of other nutrients. So they are not like refined sugar which only offers empty calories. Then this recipe uses a significant amount of ricotta cheese. Call it a hidden gem or a best kept nutrition secret, this cheese is truly marvelous. It is delicious, of course! I mean just try it with a sprinkle of cocoa, ground instant coffee and a drizzle of honey. But other than taste, it is also quite nutritious. It is low in carbs, high in protein and is a good source of calcium and provides some vitamin A, vitamin B 12 and magnesium. Especially when you choose part skim ricotta cheese, you can use these nutrition attributes and taste characteristics to create amazing recipes. Compared to conventional ice cream, traditionally prepared Indian kulfi is low in saturated fat. This recipe further gives you a range for the amount of cream to be used. When frozen bananas are blended together, it magically gives a creamy ice cream like texture. So you can get by with the lower amount of the cream. Experiment to see what amount of cream works well for you. It is important to freeze the banana slices and chill the other ingredients very well. And the popsicle mixture should be very chilled and thick before pouring it into the molds. This will ensure that the kulfi has a softer bite. If the mixture becomes thin due to the ingredients warming up, then it might help to semi-freeze the mixture and give a quick blend before transferring to the molds. Use only a small amount of almond extract as it can be very intense and adjust it according to your taste. Likewise, start with smaller amount of cream suggested in the recipe and adjust as per your preference. 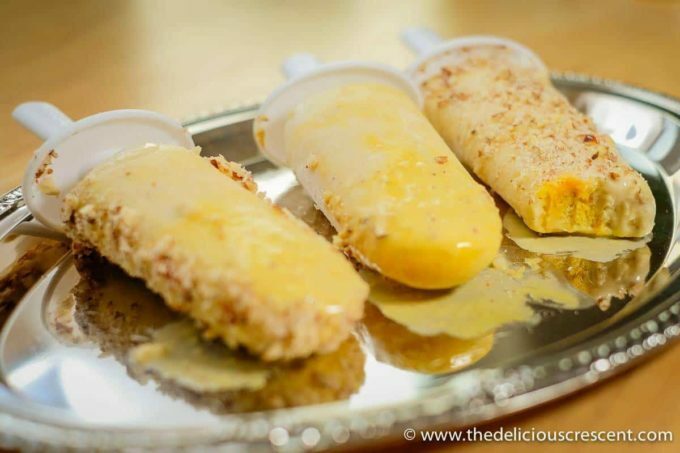 I found that the higher amount of cream gives the full creamy taste typical in commercial malai kulfis. However, I was satisfied with the lower amount in the suggested range too. Also, the mixture should be sweeter than you prefer because some of the sweet taste will be lowered after freezing the kulfi. The pinch of salt also helps to boost the sweetness. 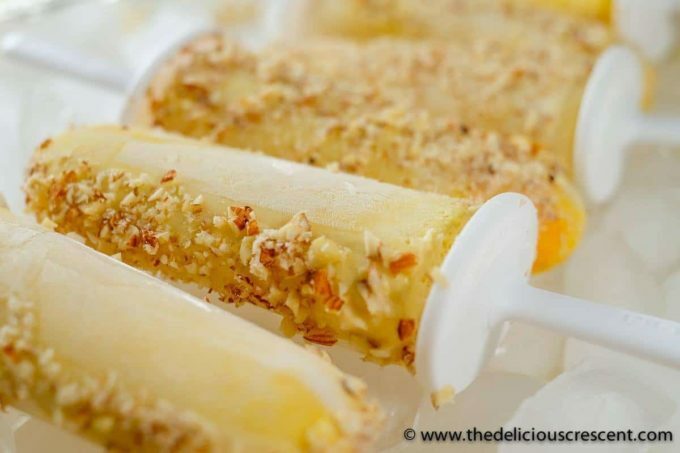 Badam malai kulfi is a traditional Indian popsicle, made amazingly easy in this recipe. But still with mouth watering creamy taste and enveloped in fragrant flavors of almond, rose, saffron. This kulfi comes with less added sugar and saturated fat but with more protein than the traditional version. Dice the bananas into small pieces. Spread the banana pieces in a single layer on a parchment paper lined sheet tray and freeze it. Transfer the frozen banana to a high speed blender. Add the evaporated milk, cream, honey, rose water, almond extract, pinch of salt and blend it. Stop and stir as needed. Adjust honey as per the sweetness of the bananas. Add ricotta cheese and give a quick blend for few seconds just to mix it all. Do not blend excessively. The well blended kulfi mixture will be thick, very chilled but with a hint of soft grainy texture from the ricotta cheese. Randomly sprinkle the saffron water drops into the mixture. 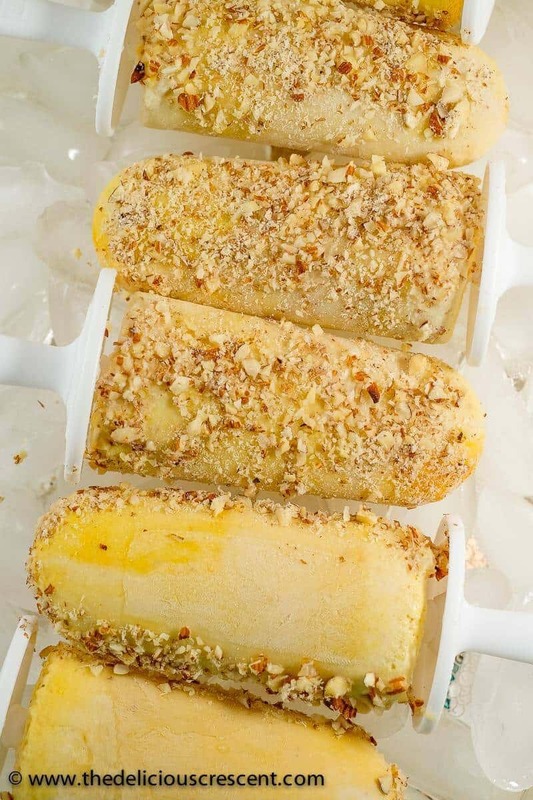 Divide the kulfi mixture into 10 kulfi popsicle molds. Place the popsicle molds in the freezer and allow the kulfis to freeze overnight. 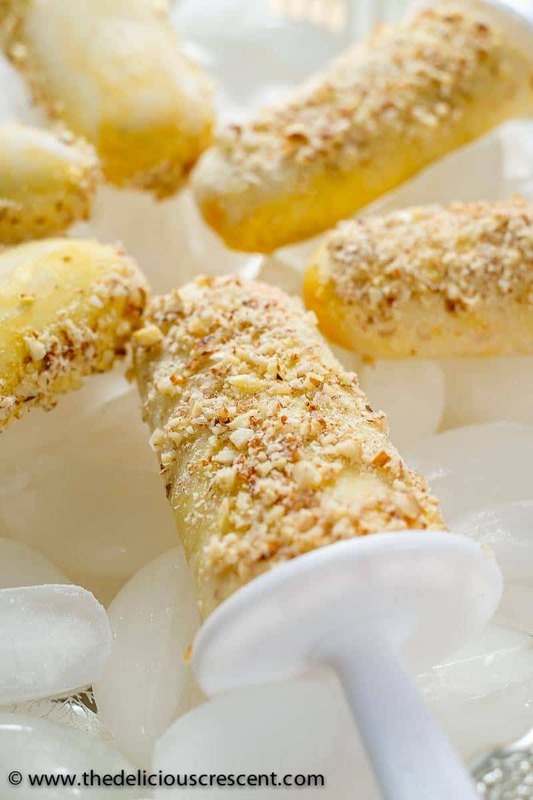 When the kulfis are unmolded, and the exterior softens a little bit, then they can be rolled in crushed almonds on the sides. Place it back on a tray and freeze it before serving. Surely you can do that and in fact it is fairly common to serve this type of a frozen dessert as you had suggested, instead of as a popsicle. Hope you enjoy it :) And also I would make sure the mixture is thick when putting in the container. This limits the ice crytal formation. And stirring in between while the mixture is getting thicker in the freezer can also help further. Oh thank you Chris :) hope you try it soon! What an interesting popsicle. I love that you used banana instead of sugar. And the flavors sound so lovely! Thank you. 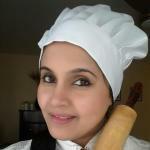 Yes its interesting how well the banana worked for this traditional recipe. These popsicles look sooooo good. LOVE the ricotta in these – it truly is so versatile! Great pops! Thanks Jenn. You are absolutely right in pointing out ricotta as the special ingredient here.